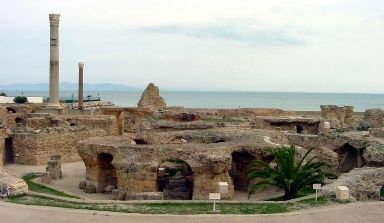 The city of Ancient Carthage was located on the coast of the Mediterranean Sea in what is today the country of Tunisia. At its peak, Carthage ruled a significant portion of the Mediterranean coast including Northern Africa, Southern Spain, and the islands of Sardinia, Corsica, and Sicily. How long did Carthage rule? Carthage was a major power in the Mediterranean from around 650 BCE to 146 BCE. It was first established in 814 BCE by the Phoenician Empire, but gained its independence in 650 BCE. Carthage grew to become the most powerful city in the Mediterranean. In 509 BCE, Carthage established a treaty with Rome. Carthage had control of most of the Western Mediterranean, Northern Africa, as well as the islands of Sicily and Sardinia. Carthage was able to keep Rome in check because of its powerful navy. Between 480 BCE and 265 BCE Carthage fought a number of wars over the control of Sicily. These wars are called the Sicilian Wars or the Greek-Punic Wars. Despite all these wars, neither side ever gained full control over the island. Carthage controlled Western Sicily, while the Greeks maintained control of Eastern Sicily. As the Roman Republic rose in power, Carthage became increasingly in conflict with Rome. In 264 BCE, Carthage fought the First Punic War against Rome. Rome defeated Carthage, taking control of Sicily. The Second Punic War took place between 218 BCE and 201 BCE. It was during this war that the famous Carthage leader, Hannibal, crossed the Alps to attack Rome in Italy. Although Hannibal won several battles in Italy, Carthage began to weaken as the war waged on. Eventually, the Romans defeated Carthage and gained control of Spain and much of Northern Africa. The Third Punic War occurred between 149 BCE and 146 BCE. In this war Rome attacked the city of Carthage. Rome conquered the city bringing an end to the Empire of Carthage. The cities allied with Carthage became part of the Roman Republic. Carthage was initially a monarchy ruled by a king. However, the government changed to a republic around the 4th century BCE. Similar to Rome they had a senate made up of 300 wealthy citizens which made the laws. They also had two main leaders that were elected every year. They were called "Suffetes", which means judges. Carthage was later rebuilt by Julius Caesar of Rome. The city became a major part of the Roman Empire. Muslim forces destroyed the city of Carthage in 698 CE. They built the city of Tunis, which is today the capital of Tunisia, nearby the ruins of Carthage. Hannibal brought elephants with when attacking Italy and crossing the Alps. He started out with 37 elephants, but many of them died before making it into Italy. The word "Punic", as in Punic Wars, comes from the Latin word "Punicus" which is what the Romans called the people from Carthage. Carthage religion included a variety of gods. The primary gods being Baal-hamon and his wife, the goddess Tanit.